I know its comparing animals but tempted to think these life extending factors can apply to human lifespan. frigid cold environments causes lower heartbeat and metabolism, can be achieved by living in cold places and doing not too much activities. Not sure if I am willing to move and live in a colder environment. Although I do love swimming relaxed in the cold water like a whale. As much low activities may be low heartbeat and low metabolism. Studies have shown that people who exercise tend to get lower resting heart rates than those who are sedentary. High intensity exercises may increase metabolism. I guess I can focus on long slow endurance when I do swimming, cycling and running. Evolution and Genetics, these is unfortunately the luck of the draw, interestingly, there are genetic therapies being developed, potentially we can identify the genes that are responsible for ageing and extend our life by altering them. Lets see if this happens in our life time. healthy immune system, these is also partly genetic, but also on how well we avoid getting sick and in addition recover from them. Medicine has come a long way in assisting us to these very well. Let’s just hope the germs don’t win the biological war against us. bigger size, partly genetic, partly nutrition. The bigger the organism the less predator they have, in addition, metabolism can be lower as the body does not need to produce heat too much to maintain body temperature. May also allow bigger animals to eat less per body weight, which lowers the metabolism again. Although my fasting might reduce my weight and thus reduce the size effect. Woke up at 4am, but didnt sleep till sun up. Booked an appointment for car service today by calling last Wednesday. Thankfully Saturday morning was available. Got picked up and went to post office at airport lama to try to get a package, but the mislabelling on the card didn’t state it was supposed to be picked up at sengkurong instead. I guess I will pick up on thursday when all government offices are open. My car has been making screeching sounds ever since I drove through floods a few months ago. Before that the engine has been rattling when it goes up hill. Apparently, it was related to the fan belt. The workshop also recommended replacing the air filter. I just accepted. It all amounted to $215. That used up a bit more than my usual car budget. With the recent bike purchase I need to tighten my own belt. Planned to buy fuel, but every fuel station was jam packed. I guess everyone was preparing for their long trips on the first day of raya. I decided to forego until convenient. Slept most of the afternoon replacing my lack of sleep in the morning. Broke fast with air bandung, fried noodles, sardine puffs, and dessert with mangoes. Checked whatsapp for any updates regarding the moon sighting, but it was mostly filled with jokes. A few reliable sources shared. But from past experience, it was best to wait for the official announcement. At 7:30pm, the announcement came, no new moon sighted. I bet its due to the weather. So Brunei wipl celebrate Hari Raya Aidilfitri or Eid on Monday. Later found out that. Malaysia and Indonesia announced that they will celebrate it on Sunday. Its funny how Brunei doesn’t follow Malaysian ruling on moon sighting anymore. It was even more funny to think about the consequences of crossing the border to Malaysia on a Sunday. Would I fast? Or do I celebrate raya? Especially considering the first day of raya is haram to fast. In any case I would be grateful in either case. If eid was on Sunday, then it would be 4 consecutive days of raya. If it was on Monday it would just be 3, but it would be an extra day to fast in ramadhan. Slept early, expected to sleep in on sunday morning. In the morning had a business plan workshop, it was disappointing to have a significantly smaller number on the last day of the workshop, but not unexpected. Kinda felt tired, but that might be from the disappointment, at the end of the class, a few people left early. I dont blame people for being unable to come or that they have to leave early, as I understand people have priorities. The last friday of ramadhan is often a day where families visit graves, also considering pay day a few days ago and raya is upcoming, some people might need to go to the bank today in the morning. In the late afternoon after a power nap, my wife and I went out on a bike ride, me with my new bike. Originally she felt lazy, but she incentivize herself to bike by requesting to eat out afterwards. So I agreed. I was setting up, I realize how many important accessories I need to buy for my new bike. A new saddle bag for emergency repair kit, maybe a bag to put extra items, and some lights. Temporarily I transferred from my old bike to my new bike and we went out. And then due to larger frame and taller saddle, I had to remove both wheels instead of the usual front wheel only, in order to fit 2 bikes in one car. 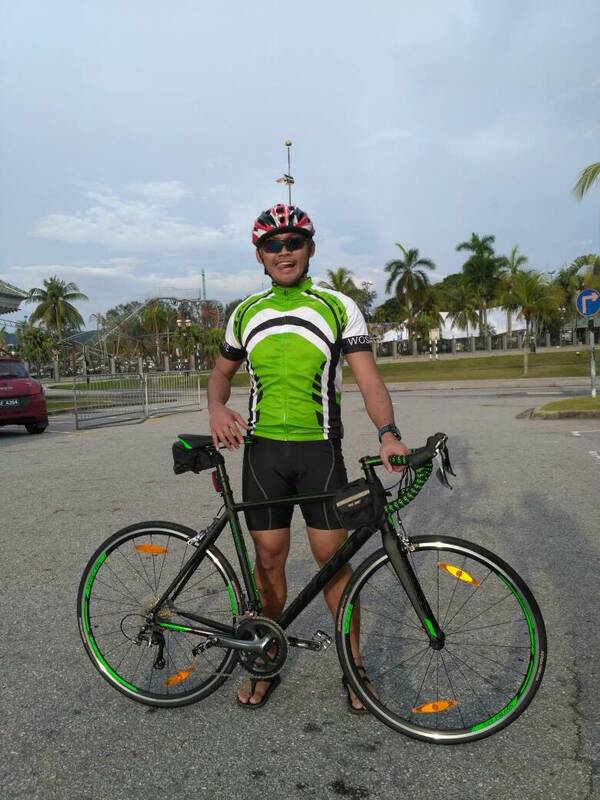 Also testing out my new bib shorts and cycling jersey that arrived yesterday. Which coincidentally matched the colour of my bike. I think green might be my new colour. When I tested the bike previously, it was around the stadium, so I couldn’t go full speed at extended periods. This time around I wanted to see how well I would do on the highway. We started off easy, as a warmup. I cant fully experience going fast on a steep climb yet on the highway, as we went sliw and relaxed. My wife didn’t want to go too far so we settled for the 8km mark and made a u-turn. It was only then on the way back with a lot of descents that we went fast, I thought I might have gone too fast and left my wife far behind, but she was doing well keeping up just behind me, so I was able to go faster with her keeping up. I was surprised how I could maintain my speed, and even more surprised that my wife could keep up. Well for a while anyway, but it was still impressive. We went fast downhill and maintained a bit of speed uphill as well. 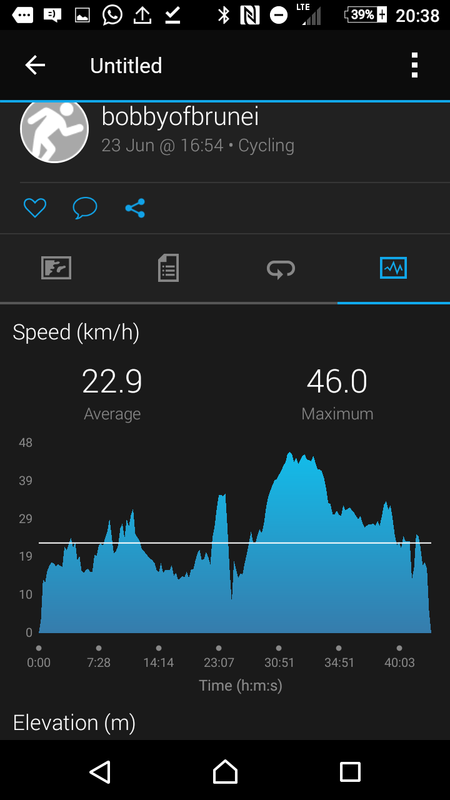 Going downhill with my urata, I would have to pedal faster to avoid the dead zone to convert the pedaling to get speed, but with the smaller teeth of 11t vs a 13t, I was able convert more of that pedalling to speed without any dead zones. That means I could potentially go faster. Our last ride was 44 mins, this time around with the longer wait at the u turn we did 42 mins. Looking at the speed graph below, potentially without the warm up, we could have averaged 30kmph. Previously with my urata, and withput drafting. I struggled to get to and maintain 30kmph. 27kmph would have been the average. What a difference a higher end bike makes. Of course I think the power I have built up with the urata over the years helped. The bike’s function is to convert that power into speed. And oh boy, did that new bike transferred that into speed. I feel more confident that I can keep up with the big boys. I look forward to riding with a group, or joining a cycling event. 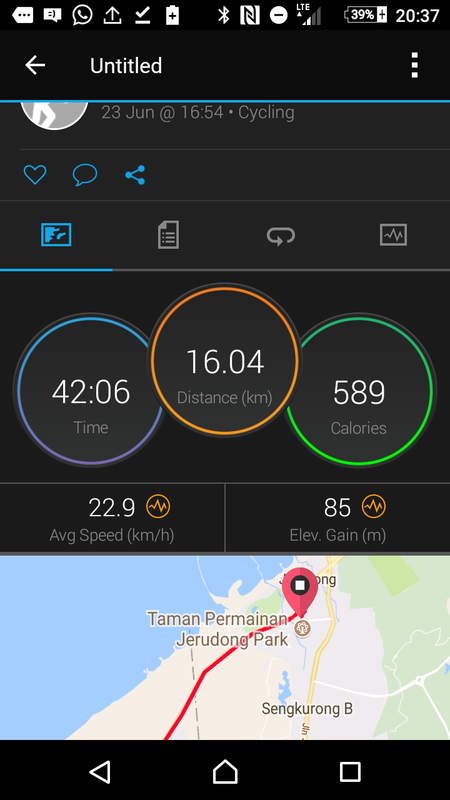 Just to see how much my speed is improved with a better bike. As we finished, I shared with my wife how impressed I was with her ability to keep up. Her faced was flush red from her attempt. I remembered this time around to do some stretches for myself an my wife, before we headed home. We got home and prepared to go out. It was only then I realized I had a few invites that day, one was a function nearby. I decided to forego the functions and just treat my wife for her achievements today. Unfortunately a lot of restaurants were full for the iftar. So we decided to delay my break (and her treat) and went off to buy some bike accessories instead at the bike shop. Bought some lights and a bottle cage, will have to look for the saddle bag elsewhere. When we went to the restaurant, they were a few available tables. We noticed that there were others that were waiting to be served as well. We were prepared for some slow and possibly bad customer service. My wife really wanted her treat, her reward, so she was willing to wait. For starters the table we got want wiped clean yet. Then it was a few minutes before we got the menu, thankfully we knew what we wanted and ordered on the spot. There a few food items that were out of stock, but there were acceptable alternatives. We noticed while waiting, a few other people left as they weren’t serviced fast enough. I acknowledged my wife for being patient as she used to be one of toys impatient people, but she shared she knows what she wanted, and wouldn’t go any where else, as if she did age any where else or anything else, from past experience, she knows she wouldn’t feel satisfied. So the food was worth the wait. The cucumber and carrot slices with the sambal paste and ambuyat sauce came first. A few more minutes passed by before the ambuyat came along with leafy vegetable, we waited a bit longer before the plates and the utensils were provided along with the hati buyah, and finally our drinks. We noticed that the service was improving as one staff from the 1st floor kitchen came down and coordinated their efforts. We empathize with the workers at the restaurant, it is not often that they have a full house. I wondered when if they did at all, broke their fast. The service was uncharacteristically slower, but it was not bad. Aminah Arif was having a good bad day. Good that they have a lot of customers. Bad that they couldn’t keep up. Done with the main course we dropped by a convenience store to buy some snacks as desserts. Soft drinks and ice cream. Then my wife dropped me off to the swimming pool for my class. 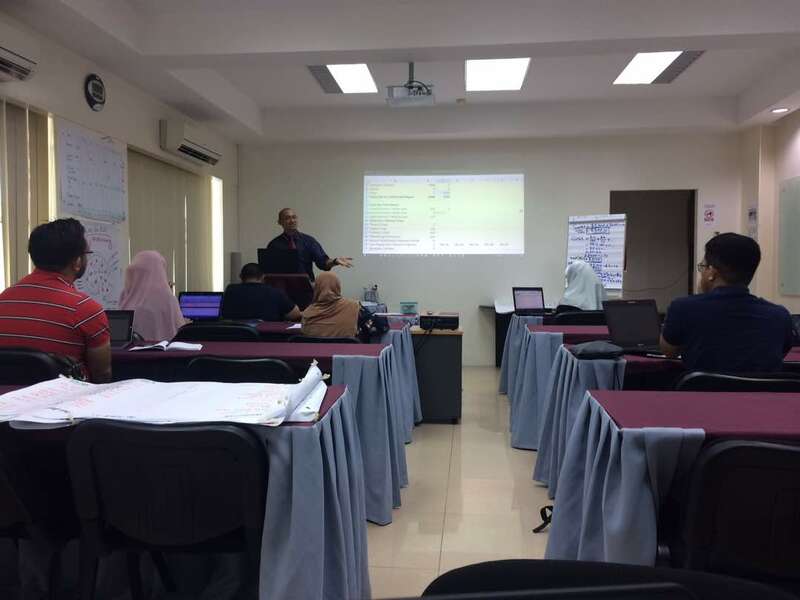 During non-ramadhan my classes were 4 sessions x 1.5 hours. But because the pool only opens at 9-10pm during ramadhan, my classes turned to 6 sessions x 1 hour. So my syllabus changed a bit. But then again, my syllabus is very flexible, as it accounts for different people’s abilities. 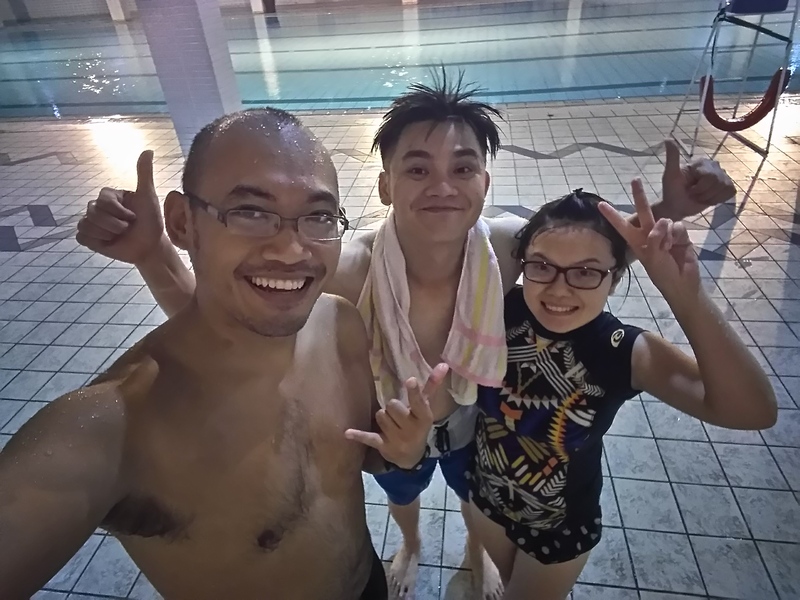 Tonight is the 2nd last class, but 1 out of 2 of my students were able to do 50m non-stop at the basement pool. But she has the advantage of being a floater. Their next session will involve swimming at the lap pool above, after refining their technique a bit more. If it wasn’t for the rain and my wife waiting in the car, i would be tempte to run. So we went staright home. When we arrived, we were so tired and sleepy. My wife wasn’t able to juice as she usually does , and I went straight to bed and dozed off.